Those who love to cruise the Mediterranean recognize the diversity of the countries and the ports of call, but the vast history, art, and breadth of knowledge coming from this region of the world are mind-boggling. All of these factors make the Mediterranean Sea a marvelous cruise destination! Twenty-three countries spanning three continents surround the Mediterranean. Some countries like Italy, Greece, Spain, France, and Turkey have many ports of call. Others like Croatia, Slovenia, and Morocco are just discovering what cruise tourism can do to help their economies. Finally, some countries are "off the beaten path" for cruise tourism, but you might be able to find a small or boutique cruise ship if you are determined to visit them. Note: Since some Mediterranean cruises stopover in Portugal, it is included in this collection, even though it is not on the Mediterranean. If you do a survey of which Mediterranean country is the most popular with travelers, there is a good chance that Italy will be the easy winner. Italy's location in the center of the Mediterranean means that it gets included in many Mediterranean cruises. Cruise ships often embark or disembark in Civitavecchia, the port nearest Rome; Venice, Genoa, or Savona. The most popular ports of call in Italy are Genoa, Portofino, Livorno (Florence, Tuscany, and Pisa), Civitavecchia (Rome), Naples (Capri, Pompeii, Mt. Vesuvius, Amalfi Coast), Messina (Sicily, Taormina), and Venice. Some of the smaller cruise ships will port at Portovenere or one of the Italian cities on the east coast such as Bari. Vatican City, or the Holy See, is a separate country located within Rome. Vatican City is home to St. Peter's Cathedral, the Vatican Museum, and the Sistine Chapel. Cruise ships porting at Civitavecchia, the port nearest Rome, provide easy access to Vatican City. Since Rome has a major airport, many cruise ships embark or disembark in Rome. France is a favorite country for many travelers, and ocean-going cruise ships visit France from the Mediterranean, the Atlantic, or the English Channel. France has several popular ports of call on the Mediterranean, including Nice, Cannes, Marseille, and Villefranche. Almost all of the large, mid-sized, and small cruise lines sailing the Mediterranean include French Riviera ports of call. Monte Carlo, the capital city of the very small country of Monaco, is one of the richest cities in the world. Cruise ships sailing the eastern Mediterranean, especially small and mid-sized ships, often include Monte Carlo and Monaco as a port of call. Spain has several popular ports of call, including Barcelona, the busiest cruise ship port in the Mediterranean. Almost all cruise ships sailing the Mediterranean have an itinerary that includes Spain. Many cruise ships embark and/or disembark in popular Barcelona. Other cruise ship favorites in Spain include Malaga, the port nearest Granada, and Cadiz, the port nearest Seville and Jerez. In addition to mainland Spain, the Balearic Islands of Mallorca, Minorca, and Ibiza are also excellent cruise destinations. These sun-kissed Mediterranean islands have long been a favorite of northern Europeans; however, cruise ship passengers also enjoy visiting them. Portugal is not​ located on the Mediterranean, but many cruise ships sailing the Mediterranean have ports of call in Portugal or use the city as an embarkation point. Portugal is a lovely small country on the Atlantic Ocean. Cruise ships sailing the Mediterranean often use Lisbon as an embarkation or disembarkation port. Other ships port in Lisbon when cruising from the Mediterranean to northern Europe. The island of Madeira, off the coast of Lisbon, is an overnight sailing from the capital. This island is beautiful and advertises eternal springtime weather. Morocco has ports of call on both the Mediterranean and the Atlantic. Morocco is less than 20 miles from Spain and can be seen from Gibraltar on a clear day. Cruise ships often port in Casablanca, Tangier, or Agadir when stopping over in Morocco. Cruise passengers can take overland trips to​ Marrakech in the interior, but it usually involves an overnight stay away from the ship. Gibraltar is a very small country at the tip of Spain. Its citizens are very proud of their British heritage. Many cruise ships on western Mediterranean cruises or those repositioning between northern Europe and the Mediterranean include Gibraltar as a port of call. Gibraltar is a great place to spend a day with something to interest everyone--history, natural wonders, and those marvelous Barbary apes! Croatia is a beautiful country on the Adriatic Sea, with the Dalmatian Islands and interesting history. Cruise ships have now discovered Croatia. Most cruise lines -- large, mid-sized, and small -- that sail the Mediterranean include one or more ports of call in Croatia. Dubrovnik is the main port, but small ships also port all along the coast or at one of the many Dalmatian Islands. Hvar, Split, Korcula, and Zadar are all popular ports of call for the smaller luxury ships. Dubrovnik is a wonderful old walled city right on the Mediterranean, and learning about the recent history of the Balkans is a terrific learning experience. 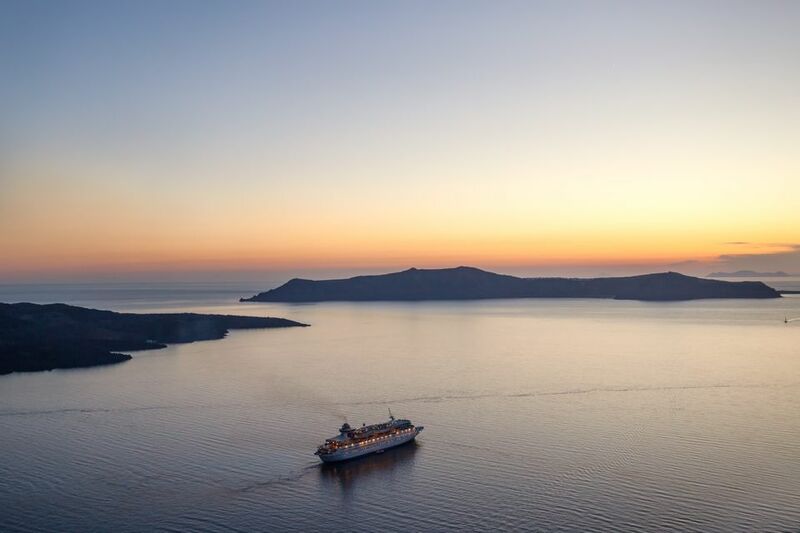 Greece's many islands, numerous harbors, and sunny Mediterranean weather make it a perfect cruise destination. Greece and the Greek Islands are some of the most popular cruise destinations in the Mediterranean. Cruise ships sailing the eastern Mediterranean often visit Athens (Piraeus), Olympia, or some of the diverse Greek Isles. 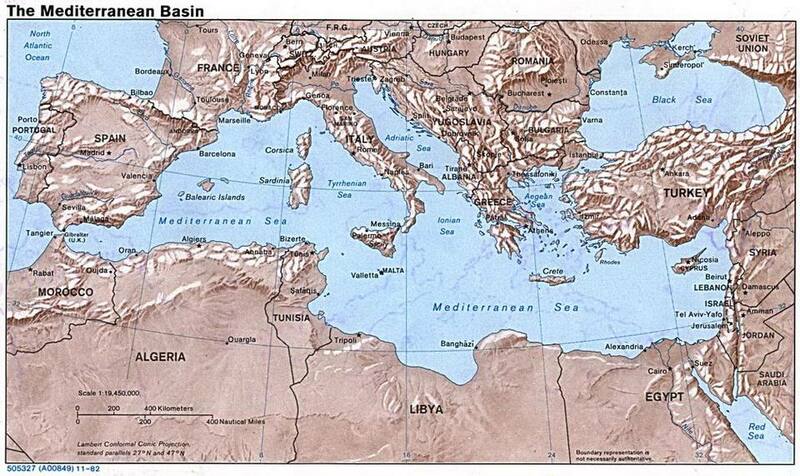 Turkey is located in the far northeastern Mediterranean. Sailing through the Bosphorus at Istanbul, cruise ships enter the Black Sea. Istanbul is the most popular port of call in Turkey, but many cruise ships also stopover in Kusadasi, which is near the ancient city of Ephesus. Other ports of call in Turkey include Kas and Antalya near Perge. The island of Malta is found in the south-central Mediterranean. Its strategic location has led to its key role in several wars throughout history. Several cruise ships include Valletta, Malta as a port of call on their Mediterranean cruise itineraries. The city of Valletta has a monochromatic look of all sandstone. It's very intriguing. Limassol in the Greek Cypriot part of Cyprus is the main port of Cyprus. Celebrity, Costa, and Royal Caribbean all have cruises with Cypriot ports of call. Cyprus is located in the eastern Mediterranean and has long been a source of controversy between Greece and Turkey, both of whom claim the island. Cyprus is currently divided in half. Its history dates back to Roman times, but Cyprus also played an important role during many wars, including the Crusades and World War II. Although Albania's economy is growing, the country is still one of Europe's poorest. However, more cruise ships port in Albania than what you might expect. Albania is located in the Eastern Mediterranean across the Adriatic Sea from Italy. Eastern Mediterranean cruise itineraries sailing from Venice or Athens sometimes include Albanian ports. Montenegro is one of the previous Yugoslav republics on the Adriatic Coast north of Albania. Only a few cruise ships visit Montenegro, but that number is bound to increase as travelers discover the beautiful coastline. Kotor is the primary port, and Viking Cruises, Regent Seven Seas Cruises, Seabourn Cruises, SeaDream Yacht Club, and Silversea Cruises all include the country of Montenegro on Eastern Mediterranean cruises. Slovenia is located on the Adriatic Sea south of Croatia. Only a small part of the country is on the coastline and Koper is the major port. Viking Cruises, Holland America Line, and Regent Seven Seas Cruises include Koper, Slovenia as a port of call on some of its Adriatic Cruises. Tartous is the main cruise port in Syria. Due to the current tensions in the middle east, no mainstream cruise lines currently port in Syria. Until the Lebanon-Israeli war in 2006, Beirut was one of the eastern Med's most popular ports. No cruise ships currently include Lebanon on their itineraries. Algiers, with a total population of about 3 million residents, is Algeria's largest city and the capital of the country. Algiers is the primary port of call. Tunisia is on the northern coast of Africa and the capital of Tunis features the Bardo Museum, and the ruins of Carthage are nearby. Israel is located in Asia on the eastern shores of the Mediterranean. Haifa, near Nazareth, is the most popular Israeli port. Cruise ships sailing the eastern Mediterranean or on cruises between the Mediterranean and the Red Sea sometimes include ports of call such as Haifa or Tel Aviv in Israel. Tripoli, Libya, on the northern coast of Africa, was a cruise ship port of call until the 2012 terrorist attacks. Most of Egypt is located in Africa, but the Sinai Peninsula is in Asia. The Suez Canal separates the two continents. For a country mostly covered with desert, Egypt has many cruise options. Cruise ships sailing the southern or eastern Mediterranean usually port at either Alexandria or Port Said. Cruisers can travel to Cairo to see the Pyramids and Sphinx on full-day shore excursions. Cruises to the Red Sea usually stopover at Sharm el-Sheikh (spelled Sharm ash Shaykh on this map) for excursions into the desert, St. Catherine's Monastery, or for diving into the brilliant, clear Red Sea. Red Sea cruises also might stop at either Al Grahdaqah or Safaga (spelled Bur Safajah on this map) to enable passengers to go into Luxor on either a full day or overnight excursion. A description of Egyptian cruises would not be complete without a reference to Nile River cruises, which usually travel between Luxor and the high dam at Aswan, and often include the option of a day trip to Abu Simbel. Over 300 river ships sail the Nile, so there are plenty of options for Nile River cruises.